Canadian comedy troupe Trailer Park Boys has added an extra date of Saturday 19th September at Brixton Academy due to phenomenal demand. The popular trio, Ricky, Julian and Bubbles, currently enjoying their ninth season on Netflix, present mockumentary-style crime and sketches in the anything-can-happen, uncensored live show. What began as a short film starring John Paul Tremblay (Julian) and Robb Wells (Ricky), first shown at the 1999 Atlantic Film Festival, has blossomed into a live show which sold out the Hammersmith Apollo on their last visit to London. Now the boys are back and promise more drinking, swearing, drinking, hot dogs, music and drinking. 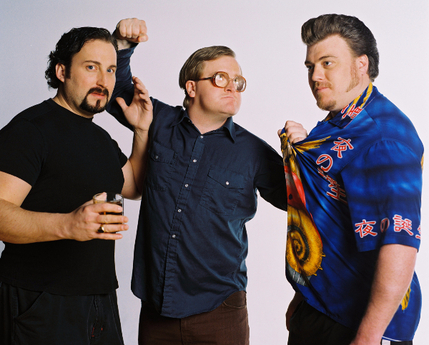 What are the best dining options near Trailer Park Boys: Drunk, High and Unemployed London? Trailer Park Boys: Drunk, High and Unemployed gyms, sporting activities, health & beauty and fitness. The best pubs near London Trailer Park Boys: Drunk, High and Unemployed. Trailer Park Boys: Drunk, High and Unemployed clubs, bars, cabaret nights, casinos and interesting nightlife. Where to have your meeting, conference, exhibition, private dining or training course near Trailer Park Boys: Drunk, High and Unemployed. From cheap budget places to stay to luxury 5 star hotels see our special offers for O2 Academy Brixton hotels, including Dolphin House Serviced Apartments from 82% off.